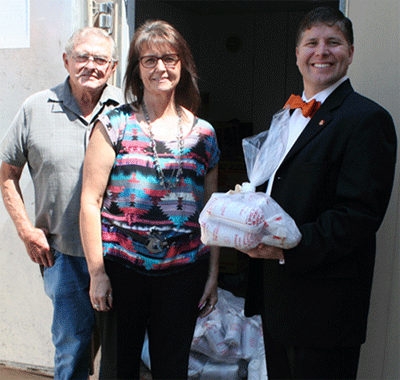 Following the purchase of a steer during the Cowley County Fair 4-H/FFA Market Livestock Auction held at the Winfield Fair Grounds on Aug. 4, Cowley College donated a total of 302 pounds of meat to Manna Ministries in Arkansas City and the Winfield Community Food Pantry on Tuesday. The College began purchasing cattle from local 4-H members and donating the beef to local food pantries in 2010. “It is our pleasure to partner with community organizations which have shared interests, namely making people’s lives better. 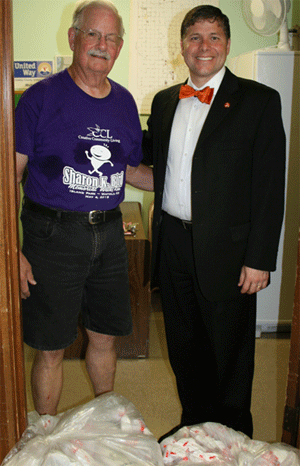 What greater joy in life is there?” Cowley College president Dr. Dennis Rittle said. Representatives from the college met with Lisa Palmer, director of Manna Ministries, to deliver the beef. Manna Ministries is a faith based food pantry housed at the First Baptist Church, located at A Street and Central. They welcome all donations and hold a distribution on the last Saturday of each month. The food pantry continues to grow as they service the southern half of Cowley County. Palmer is glad to have the college as a partner to the food pantry. Entrance to Manna Ministries is thru the north parking lot of First Baptist Church on Chestnut Avenue. Families will need to bring picture ID, proof of income, and proof of residence in order to receive the packaged beef. Wes Locke, who has been a volunteer at Manna Ministries since it opened in 2000, said on average Manna Ministries serves over 300 families and 700 people per month. “The people are grateful for the ministry,” Locke said. Following the delivery of the roast and hamburger meat to Manna Ministries, college representatives delivered the other half of the beef to the Winfield Community Food Pantry. Representatives from the college met with Phil Jarvis, Director of the Winfield Community Food Pantry, at the Grace United Church in Winfield, to deliver the beef. The Winfield Community Food Pantry is dedicated to assisting the people in northern Cowley County who are in need of quality service, useable food items, and a nurturing and caring atmosphere. The Pantry is housed in the basement of Grace United Church and pays no rent or utilities. The Pantry, which is located at 320 College Street, is staffed entirely by volunteers. The Pantry’s 1,162 visits and 5.972 people served since the beginning of the year is the highest figure through the month of August since the Pantry opened. Families coming to the Food Pantry must complete a referral form, have proof of a Winfield area address and meet the income guidelines. Eligible families are given staple items and vouchers to use for fresh food at a local grocery. The Pantry is open from 8:30-11 a.m., Monday through Friday. The meat was processed by Cedar Vale Locker.